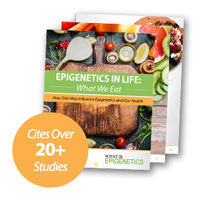 What You Eat Adjusts Your Gut Microbiota and Epigenetic Marks | What is Epigenetics? We’ve long known that what we eat affects the microbes in our bodies. Right now, hundreds of different species of bacteria are churning in our stomachs, working to protect us as well as survive within us. New research is showing that the bacterial microbiota of the gut could place chemical tags on our DNA and influence gene expression, potentially impacting our health and many aspects of our lives. Researchers have found that these microbes send out metabolites that impact epigenetic marks on histones, or the proteins that DNA is wrapped around, in order to communicate with the host. Their actions can not only adjust gene expression in the stomach and colon, but also in tissues from numerous other parts of the body. In the study, the researchers assessed colon, liver, and fat tissue and compared mice that were germ-free versus those whose gut microbes were active. They discovered that the epigenome of numerous tissues in the mice was altered depending on the community of gut microbes. Then they investigated whether two diets impacted the gut microbiota. Some mice were fed a normal, healthy chow diet and others were fed a Western-type diet that was low in fiber and carbohydrates and contained high amounts of simple sugars and fat. The results indicated that the diets did indeed alter the collection of bacteria in the gut in distinct ways. “The gut microbiota produces a myriad of metabolites that affect host physiology and susceptibility to disease; however, the underlying molecular events remain largely unknown,” the researchers reported. The mice on the Western diet produced less of particular metabolites – short-chain fatty acids acetate, butyrate, and propionate – than mice on the regular diet. Denu believes some of these metabolites, which are produced by microbial fermentation of fiber, might be crucial to causing these epigenetic effects spread throughout various mouse tissues. Lastly, they began to elucidate the link between metabolite production and epigenetic adjustments. Global histone acetylation and histone methylation levels differed depending on the mice’s diet. These epigenetic histone modifications can impact chromatin structure, thereby opening or closing access to certain genes during transcription. This can dictate whether some genes are expressed and some are not. The team wanted to verify whether the metabolites produced were leading to the epigenetic change so they looked more closely at the germ-free mice. They put three short-chain fatty acids in their drinking water and found that the same epigenetic changes occurred as the mice on the regular, healthy diet. Specifically, they assessed the mice’s tissues and the epigenetic signatures mimicked each other. Although further work needs to be carried out to translate these findings to humans, there is still significant evidence which speaks to the influence that gut microbiota has on our health and potentially our epigenome. In those with diabetes and cardiovascular disease, Rey indicates that there is less bacteria that produces butyrate and that this short-chain fatty acid may reduce inflammation in the intestine. Source: Krautkramer, et al. (2016). “Diet-microbiota interactions mediate global epigenetic programming in multiple host tissues.” Molecular Cell, 64(5):982-992. Reference: Cell Press. Changes in the diet affect epigenetics via the microbiota. EurekAlert. 23 Nov 2016. Web.